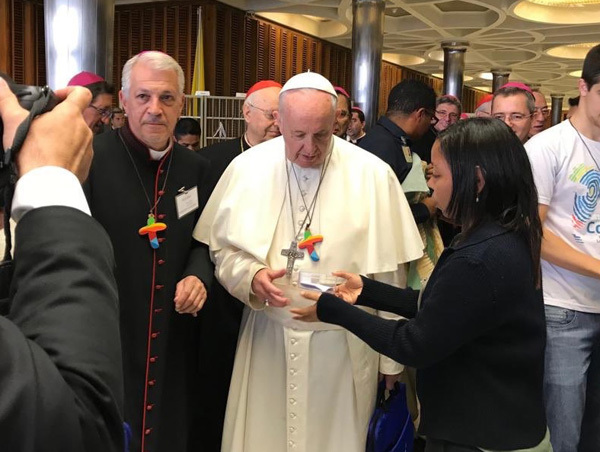 On October 17, 2018, Pope Francis received a rainbow pectoral cross at the Youth Synod and started to wear it immediately, above, first and second rows below. Following his example, soon afterwards many Bishops present at the event were also wearing similar crosses, third row. The cross was created by the Latin American Conference of Bishops – CELAM – for the World Youth Day 2019 that will take place in Panama. Supposedly – or so the CELAM pretended – each color of that cross is a symbol of a different area in Latin America and its own eco-system. Despite this theoretical explanation and given that the rainbow has unfortunately become identified with the homo movement, we believe that those who created this cross did so to oblige the Bishops who will be present at the WYD-2019 to wear it. It is yet another way to promote homosexuality, and particularly to encourage the WYD participants to accept this vice. The launching of this symbol during the Youth Synod in Rome, which is supposed to give moral orientation to young Catholics, also sends the implicit message that the Synod should open Catholic morals to homosexuals and all those who have similar anti-natural vices, today classified as LGBT. By the way, for the first time this acronym was used in one of the preparatory documents of the Synod. Pope Francis – faithful to his faithless custom of sending ambiguous messages – wore that cross to pressure the Synod participants to adopt a progressivist approach in the final document. To open the eyes of those Catholics who, taking an ostrich position, deny that this rainbow cross de facto symbolizes the Conciliar Church's complacence with homosexuality, we are posting, in the fourth to the sixth rows, photos of Francis wearing a rainbow bracelet in 2014. At that time no Bishops Conference tried to justify those colors as symbols of areas or eco-systems: They were considered as a clear support for homosexuality.